“We give people backpacks, that’s what the governor does,” Greene said to the students choosing from an array of designs and colors. And he also handed the kids lime-green sunglasses with his name on the side, because he’s also asking for parents’ votes. 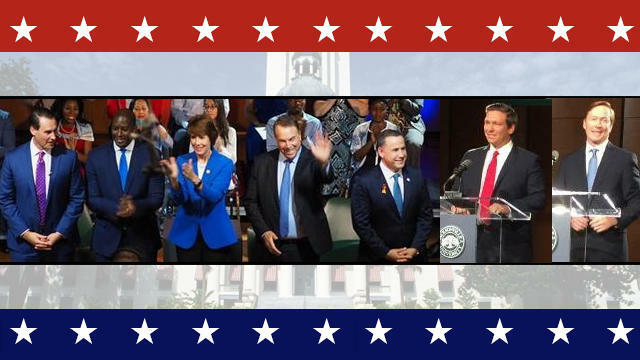 It’s the first new school year since February’s Parkland shooting and he’s in a crowded primary with four major democratic competitors. On his bus, wrapped with the phrase “Trump’s worst nightmare,” Greene blames lobbying by the National Rifle Association for too many guns, including assault weapons being on the streets. Greene is referring to a new state law requiring schools to have either sworn officers or trained, armed guards, called guardians. Many school boards who didn’t want to use guardians are hiring them anyway because sworn officers cost too much. Tallahassee Mayor Andrew Gillum, another Democrat, criticized the legislature’s response to Parkland during a March interview with WJCT News. 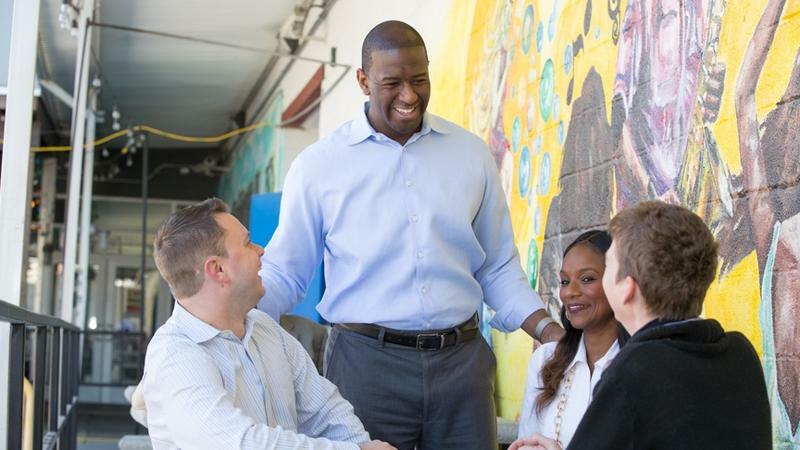 “I thought that it was woefully inadequate for the moment that we now find ourselves,” Gillum said. He said many parts of the law, like raising the age to buy a gun and banning bump stocks, should have been done anyway. 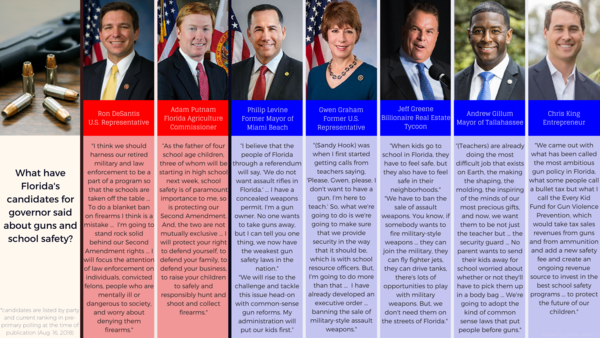 All five Democrats are campaigning on banning assault weapons. It “would be a dedicated revenue source which would invest in the very best programs, initiatives and technologies to prevent everyday and mass-tragedy gun violence,” he said. King said that would be done by taking sales tax revenues from firearms and ammunition and it would add an additional six percent safety fee, which has been commonly called a bullet tax. 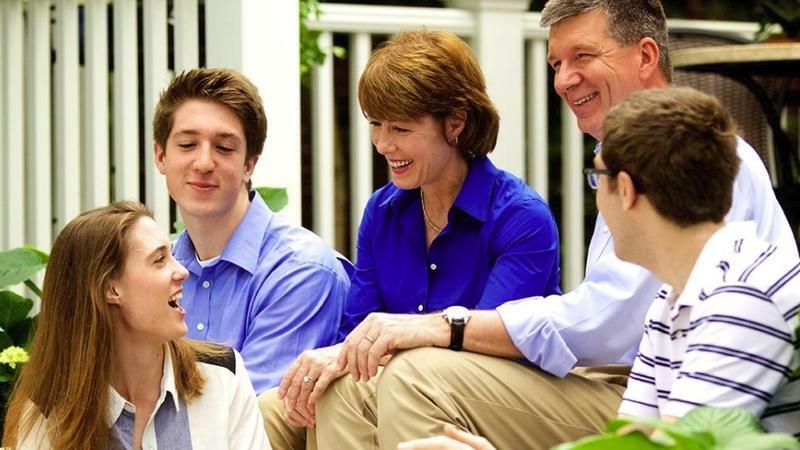 Former congresswoman Gwen Graham is the Democratic frontrunner in recent polls. She said during an April interview with WLRN she supports the Second Amendment, but also wants what she calls common sense gun safety, and she supports Parkland students who have mobilized around the issue. And she agrees with former Miami Beach Mayor Philip Levine, who said during an April interview with WJCT News that local governments shouldn’t have to wait for state-level action. 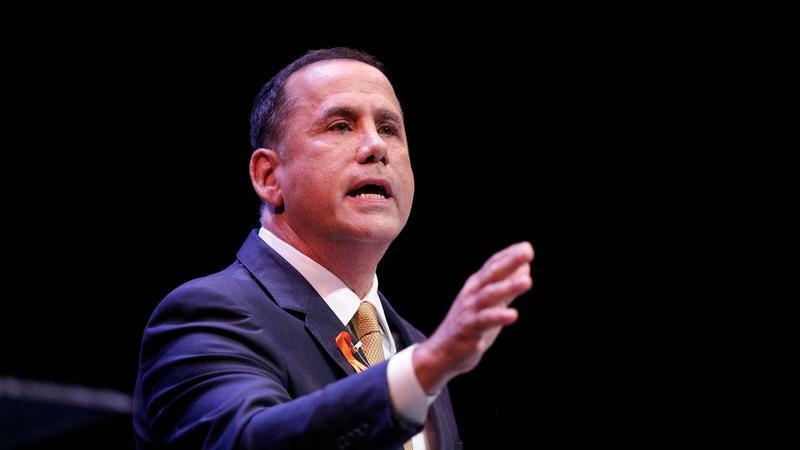 “If I'm honored to be elected governor, I’m going to allow the local communities once again to be able to control their own local laws and regulations because they know what’s best for their communities,” Levine said. Levine said he’s a gun owner and isn’t trying to take them away. “But I could tell you one thing, we now have the weakest gun safety laws in the nation and if I’m honored to be elected governor we will have the safest gun regulations in the nation,” he said. He said if the Legislature won’t pass an assault weapons ban and better background checks, he’ll campaign for a public referendum. Then there are the Republicans: state Agriculture Commissioner Adam Putnam and Congressman Ron DeSantis. 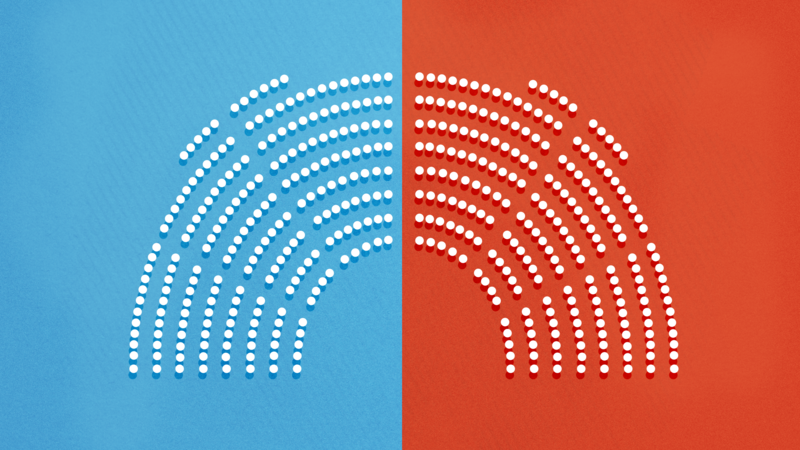 Both strongly oppose banning the assault weapons class of firearms. DeSantis said during the last debate at Jacksonville University he’s mostly concerned about denying guns from “convicted felons, people who are mentally ill or dangerous to society,” he said. 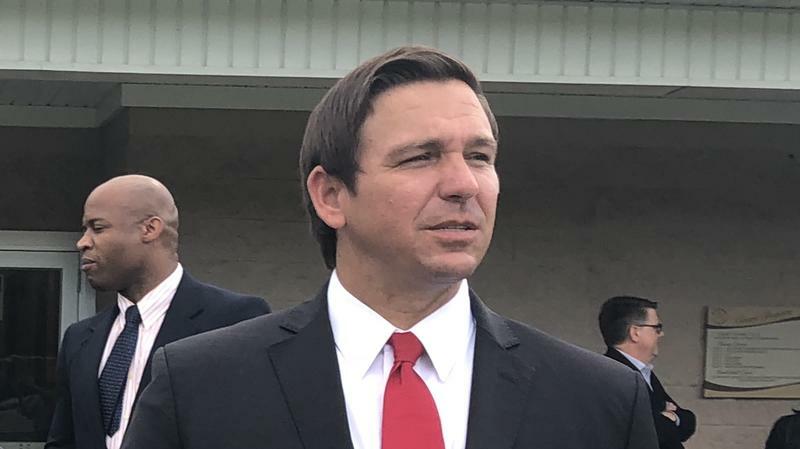 And when it comes to keeping students safe DeSantis said schools need to be secured. Putnam said as a dad with kids in school that school safety is of paramount importance to him. Local police, schools, state agencies and the FBI should communicate better amongst themselves when someone presents red flags, like he says were missed before the February shooting in Parkland, Putnam said. The Florida Primary is August 28.